At £12 this beautiful Neom set shows incredible value for money for what technically is a luxury and organic gift. 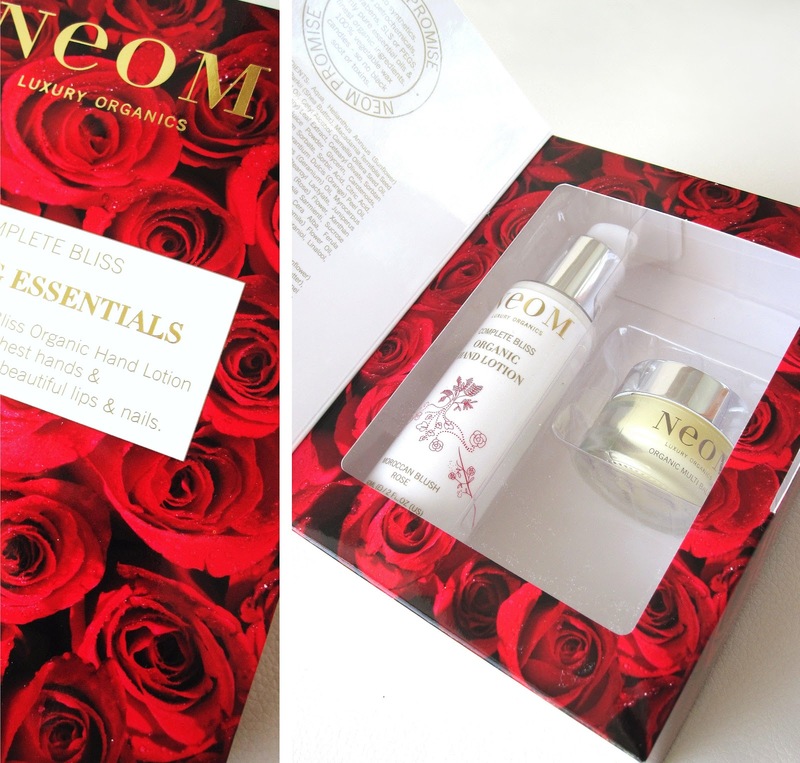 The Neom Complete Bliss: Handbag Essentials Set consists of - Organic Moroccan Blush Rose Hand Lotion (60ml) and Organic Sweet Orange & Ginger Multi Balm (14g) and has really impressed me on the value and luxury front, which is why I wanted to write about it so much. Plus I think it would make for a perfect Mother Day present as the are a choice of three sets which come beautifully presented with there own posh gift bag (see pic below)! The Multi balm is my new favourite luxury handbag item... but I will come to that later. I actually visited Morocco a few years ago now and all the rose skincare products smelt exactly like this - it's definitely a scent that is very different from the traditional soft rose scent. It's more heady and almost herbal/lavender based. The lotion itself is great as it's neither a milk or a thick lotion - just somewhere in the middle that makes for a non-sticky, easy to use hand cream which sinks into the skin nice and quickly. Has it actually made my hands softer? I'd actually say yes and more noticeably on the backs of my hands. As for the packaging it's very slimline and chic as you can see...with it's only downside being that the pump doesn't feature a lock, so maybe not safe enough for the handbag... which is a shame as it is light enough to carry around with you and it does after all come in a handbag essentials set. I am truly in love with this product for some many reasons. Firstly it reminds me of the type of product you would see in the likes of Space NK most likely to be stupidly priced at £25 or so as it's so heavy and luxurious looking. But of course it's not, as it actually works out at only £6. Secondly you get an amazing 14g of product and thirdly the product is just really, really beautiful. The product as it says is a multi use balm - which means it can be used as a lip balm, a cuticle oil or on any dry patches of skin you may have. The scent is light and citrus with a hint of ginger, just nothing over powering which I'm quite pleased about. As I don't really tend to get dry skin, I have been using this on my lips and nails (in place of my Ciate Love Me Oil) as a night treatment. For my nails I just rub my finger on top of the balm and rub the light oil into my cuticles - as the balm is so light and not thick or greasy is isn't something that you really need to rub in to carry on what you are doing. It just soaks into the skin and your done. I'd have to say this is working alot better for me than the Ciate Oil I have been using for over 6 months now... but you will have to tell me what you think when you see my fingers in an upcoming nail post! As for using it as a lip balm - I've found it abit odd, but it definitely works. You see I apply quite a lot of this onto my lips but it's still feels really light and just oily...but within 5-10 minutes or so it's totally soaked in and my lips feel like I haven't even applied the balm. But I wake up with soft lips! So it's definitely working as a lip balm but I'm just not use to the non-gloopy/thick formula. All in all a totally beautiful product that you will want to get out of your handbag! Now as I love this set so much I'm actually going to give the Really Luxury:Handbag Essentials Set (which comes with a different scented hand lotion and in a different box) as a gift to my own mother for Mother's Day (April 3rd). Gift wrapping is £1.50 at Neom but I actually like wrapping gifts plus it means I can show you all what it looks like. So I'm thinking of wrapping it in some nice gold/ivory paper and using the straw like packaging that comes with the product to protect it in the nice gift bag above! Beautiful & savvy I'm thinking. I think from a luxury brand that sells there Ultimate Candles at £150, this is such an affordable yet beautiful treat or present! Next I'm going to review the Caudelie Travel Set that's a bargain at £8 I think, but feel free to suggest any gift sets under £15! Mothers day isnt til April? Really? Might have to buy my own Chanel foundation in that case. drat was sure it was in March, I know its only 3 more days but still! Wow, this seems brilliant. My mother is always on the look at for great products. She uses everything I get her (even if she doesn't really like them) That woman can find so many good uses for unused products! Where can I get this? Just from the Neom site? @Debbie - haha you can't ask for foundation for Mother's Day! It's is odd it being in April this year...I just always associate March with Mothers Day. @Meowcake - Great value isn't it and it looks so nice as well. I went to Morocco in September and marvelled at their natural goodies! In fact my blog review of Moroccan Oil has loads of my holiday snaps in it!